Tales from a mom trying to stretch her paycheck. We’ve been breaking drinking glasses left and right in this house. 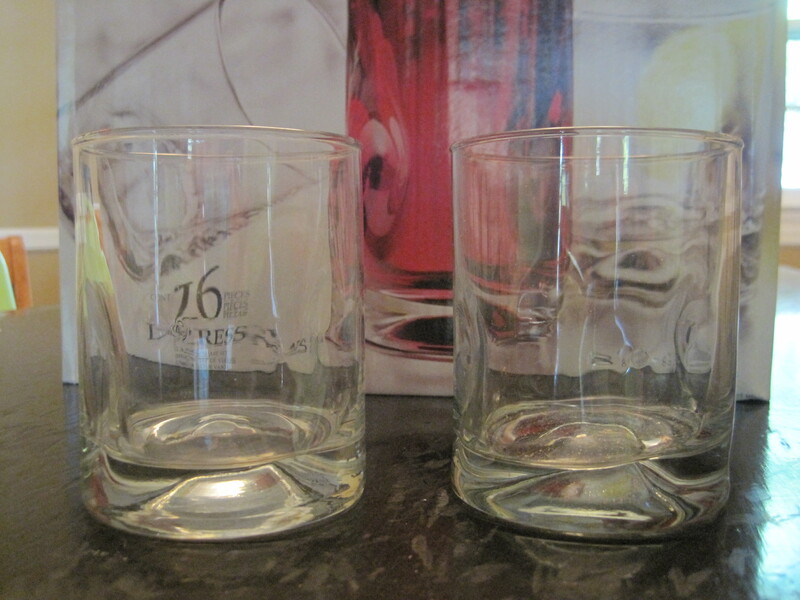 When we got married, we were given 16 glasses that came from Crate & Barrel. Though nothing fancy, the glasses were solidly built and comfortable to hold. We’re down to about three glasses. So when a coupon from Kohl’s came in the mail for $10 off a purchase of $10 or more, we headed on over to see if we could find a decent replacement that was easy on the budget. We could have opted to just replace the glasses with the same ones from Crate & Barrel. They weren’t terribly expensive at $1.95 each, but we no longer live near a Crate & Barrel and to replace our whole set plus shipping and handling would have cost over $40. That seemed silly given that with Captain Destructo Charlie around, the glasses might not have a long life anyhow. We picked through the various options at Kohl’s and stumbled upon glasses that looked an awful lot like the ones we received as a wedding present from Crate & Barrel. Upon closer inspection, they were the exact same ones from Crate & Barrel (even had the same name). Kohl’s offered a set of sixteen glasses for $37.99. Though this wasn’t a huge savings from Crate & Barrel, we had the $10 off coupon, so I figured it was a good deal for us. And then I noticed the sign. Oh, the sign. All glassware on sale. Sets that retailed for $37.99 were on sale for $19.99. Stacking our $10 off coupon with Kohl’s sale on glassware meant that our grand total for the set of 16 glasses, after tax, was $10.76. When we got home, I took one of our old glasses and one of our new ones and asked Mark to see if he could tell the difference between the two with his eyes closed. I am not too proud to say that I was positively gleeful when Mark misidentified the glasses. Turns out the only difference is that our old glasses are a little cloudy after all their wear and tear. The new ones are beautifully clear. Can you tell which is old and which is new? It was not too long ago that I never used coupons. Now I’m a giddy couponing fool. For the most part my coupon use has been confined to grocery stores and drugstores (which I wrote about here and here). I do use coupons for Bed Bath & Beyond and occasionally for Kohl’s, but that’s mostly because they just show up in our mailbox and I don’t actually have to do anything to get them. Also, despite having expiration dates printed on them, Bed Bath & Beyond coupons don’t expire so I just put them in a drawer and grab them when I’m heading over to the store. This weekend, Mark and I decided to buy some new clothes for Charlie. In theory the weather around here will start getting cooler soon (although you’d scarcely know it by the never-ending summer we’re having) and Charlie has outgrown most of his pants and long sleeve shirts from last season. We decided go to Old Navy to see what they had to offer in Charlie’s size. Inspired by a recent Kohl’s trip where I saved a ton of money on clothes using a coupon they’d sent in the mail, I did a quick Internet search for “Old Navy coupons” and found several options. The first was $10 off a purchase of $50 or more that I found here. The second was for 30% off a single item that I discovered here at retailmenot.com. I printed both and off we went. Old Navy had great options for clothes for Charlie and we ended up with about 7 or 8 items. The two coupons I printed couldn’t be used in the same transaction, so I took one of our more expensive items and bought it with the 30% off coupon, and Mark bought all the other items with the $10 off coupon. We ended up spending $56 and saved $14.50. In addition to retailmenot.com, there are lots of different sites that offer printable retail coupons as well as discount promotions that you can use when ordering online. Here are just a few I found recently (as well one site I just happen to be aware of since I know the guy who runs the site): ultimatecoupons.com, couponclock.com, myretailcodes.com, and fatwallet.com. Do you have any recommendations for how to get retail coupons? If so, do tell! I’ve recently started to clip coupons in an effort to save money on our groceries and toiletries. A couple of weeks ago, I wrote about tricks I’d gathered from other bloggers about how to be coupon savvy. Since then, I’ve learned a few more tips to maximize savings through coupons. Here’s what the above deal means in non-experienced-couponers’ language: CVS has Old Spice and Gillette Body Wash on sale for $4. If you buy one of these, you’ll get $4 ExtraCare Bucks (ECBs) back; but you’re limited to purchasing two body washes. The next line details the coupon to use: a buy-one-get-one-free (B1G1) coupon on Gillette or Old Spice from the Proctor & Gamble (P&G) coupon insert from the May 2nd Sunday paper. The third line details the savings: you’ll essentially be up $4 (MONEYMAKER) when you buy (wyb) two with the buy-one-get-one-free (B1G1) coupon. (Frankly, even if you don’t have a B1G1 coupon, this is still a good deal — buy a body wash for $4 and get back $4 ECBs to use on another purchase). Now that I know about these serious coupon bloggers, I search their sites for the biggest store deals each week. These are deals for things that I can get for free (or close to it) or for items that will pay me back (the “moneymakers” like the Gillette deal above). On Saturday night, I reviewed the CVS deals posted by the bloggers and went looking for the corresponding coupons I had. Luckily for me, I had the Old Spice/Gillette Body Wash coupon. While we don’t normally use body wash, if it is free or if CVS is essentially going to pay me to buy it, then I’ll buy the body wash, water it down, and use it as hand soap (or I could always donate toiletries to a local homeless shelter). In my online search for CVS deals, I found that I also had another coupon for cereal that I could use in conjunction with a sale at CVS. Finally, I wrote down a list of the deals I was going to get at CVS the next morning so that I wouldn’t get confused once I got there. 1. Scanned my ExtraCare card when I entered the store. I received 5 coupons which, although I didn’t use them yesterday, I’ve put aside for another time. 2. 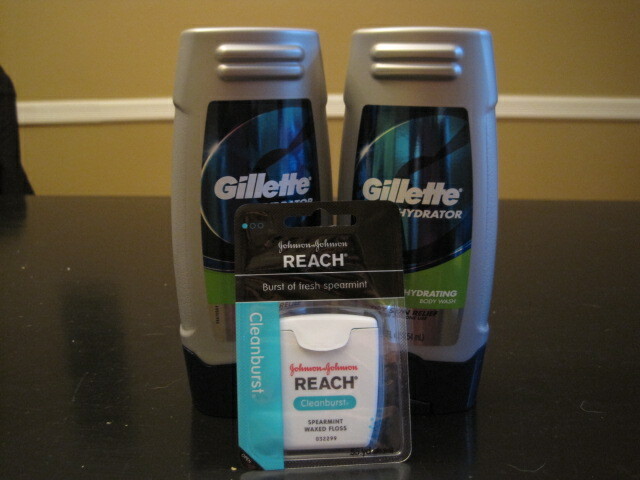 Bought two Gillette Body Washes using my B1G1 coupon. The retail price for each was $4.99; CVS was offering the body wash on sale for $4 and offering $4 in ExtraCare Bucks for each. The cashier rang up the items and the pre-tax total came to $8. I gave her my B1G1 coupon which, it turned out, was based on the retail price ($4.99) rather than the $4 sale price. So $4.99 was taken off my bill, making my pre-tax total $3.01. The cashier gave me my receipt which had my $8 in ECBs coupon at the bottom. I took my items to the cashier and the total came to $15.55. Then I handed the cashier the $2.50 coupon as well as the $8 ECBs I earned from the Gillette body wash. The final pre-tax total was $5.05. But, the dental floss gave me an additional $2 ECBs. Had I bought all of these items at their original retail price, I would have paid $35.02. Instead, my entire visit to CVS cost me $8.38 plus tax (which represents a 76% savings). In addition to the weekly deals that coupon bloggers post, CVS also does the work for me to find special deals. Their weekly flier, which is included in the Sunday paper, not only lists their sale items for the week, but also lists which of their sale items have corresponding coupons in that Sunday’s paper. For these items, there’s a little black icon next to the sale item in the flier which depicts a pair of scissors and says “coupons in Sunday’s paper.” Couldn’t be simpler. I’ve been consulting the coupon bloggers for weekly CVS deals for several weeks now, but I only just realized that there are also coupon bloggers who post the best coupon deals for my local grocery store. I found them yesterday by googling, “Harris Teeter coupon 5/19” (Harris Teeter changes their weekly specials on Wednesday of each week, so I knew the latest deals began on May 19th). Google returned several hits of coupon blog posts for current Harris Teeter deals (like this and this; if you’re near a Harris Teeter, both of these sites show some items you can get for free along with a link to printable coupons for those items). To find deals at the stores where you normally shop, just do a similar Google search for bloggers writing about those stores. I’ve routinely seen posts about weekly specials at Target, Rite-Aid, and Walgreens, just to name a few. B. Shop when other people don’t. As a novice coupon user, at times I get confused by deals, especially when I’m trying to stack store coupons with manufacturer coupons. Store salespeople are very knowledgeable about coupons and, in my experience, are happy to help clear up confusion. I shop at odd times rather than during busy periods so that if I have a question or if I want to make multiple purchase transactions during a single visit, they will help me and not get annoyed. C. Shop the same store at the same time each week. This tip goes hand-in-hand with shopping when other people don’t. I try to go to CVS first thing Sunday mornings. I’ve been doing this for several weeks now. I started going on Sunday mornings because it was convenient for me and I knew the store wouldn’t be crowded. An unexpected benefit of shopping on the same day and time each week is that the same salesperson is always working. She now knows me and we’ve developed a friendly relationship. She knows I’m trying to save money with coupons and has started pointing out deals to me or offering tips on how best to maximize the coupons issued by CVS. Frankly, who better to offer tips about the CVS deals than the cashiers? They see people successfully saving money all the time. Also, cashiers have the ability to override the register; that is, if a coupon doesn’t scan properly, the cashier has the ability to enter the discount manually. This happened to me twice yesterday and both times the cashier pleasantly gave me the discount herself. Though I’m sure she would have done this for any customer, she seemed particularly nice about it because we now have this friendly relationship. I, in turn, helped her out because she was trying to train a new cashier and needed someone to act as a “guinea pig” customer. I was more than happy to oblige because I got to hear her explain coupon stacking to the cashier trainee, which was certainly beneficial to me. So that’s it for my newest tips on how to be coupon-smart. But what about you — are any of you experienced coupon users? Are any of you just starting out like me? Or, do some of you completely hate coupons (in which case, thanks for reading this crazy long blog post — you must really be Yikes Money fans!)? Many years ago I routinely clipped coupons, but over time I found that I wasn’t really saving any money. Instead, I fell into a trap wherein I’d buy an item just because I had a coupon for it. Sometimes I’d buy things I wouldn’t ordinarily purchase and didn’t really need. Other times I’d buy something I needed, like toilet paper, but would buy the name brand I had the coupon for even if the store brand without a coupon was less expensive. Coupon stack. Coupon stacking refers to using manufacturers’ coupons in conjunction with store discounts. When coupons are released by manufacturers, stores often follow suit by discounting the same item. Experienced couponers don’t use their valuable manufacturers’ coupons without additional discounts from the store. Manufacturers’ coupons are usually good for about 4-6 weeks. Grocery stores and drug stores offer discounts on items for one week and will rotate their discounts about every six weeks. If you have a coupon for an item that isn’t currently on sale at the store, wait to use your manufacturers’ coupon until it is on sale. Give up brand loyalty. If Colgate toothpaste is on sale and you have a coupon for it but you normally use Crest, well, buy Colgate. This makes sense to me, of course, but there are some products I’m not willing to give up because I love them. Below I detail how I broke this rule during my recent trip to CVS (although I still managed to get a pretty good deal). Shop for bargains, not items. By reviewing the coupons you have in conjunction with store discounts, choose to purchase items because they’re bargains, not necessarily because you need them at the moment. This is a tough idea for me because we are trying to live on a weekly budget. Why would I buy toilet paper this week if I don’t currently need it? The answer is because for items that will necessarily be needed and used at some point – like toilet paper – buy it when there is a bargain and stock up. Shop at multiple stores. To get the best bargains, it may be necessary to shop at multiple stores. For me, I do this sparingly because I just don’t have the time to drive to several different stores to do my shopping. That being said, I do routinely go to the grocery store for food items and the drugstore for toiletries in the course of a week. Also, I sometimes will go to our big chain grocery store followed by a trip to Trader Joe’s a few days later. I could easily plan better to save more by shopping for specific sale items at the different stores. Make multiple purchases at the same store. I address this money-saving technique below as I recount my recent trip to CVS pharmacy. Using the tips above, I decided to see whether I could score some good deals using coupons. Mark bought a Sunday paper for $2.00 just so we could get the coupon inserts (I think if you’re really savvy, you could get the inserts for free by going to your local library and ask for them from one of the several Sunday papers they get). The Sunday paper also had the CVS flyer that lists the in-store sale items for the week. CVS offers a free discount program called “Extra Care” which works in the same manner as grocery store customer discount cards. My Extra Care card hangs on my key chain and the teller scans it when I pay for my items. CVS only offers discounts to Extra Care members. CVS also offers Extra Care Bucks (called by experienced couponers “ECBs”) to members. ECBs can be used on anything in the store. An example of an ECB deal might be something like this: buy Dove liquid soap on sale from $4 to $3 and earn $1 ECB. That means that a shopper will pay $3 for the soap and the receipt will show an additional coupon for $1 Extra Care Buck to be used on the next purchase. With the Sunday newspaper coupon inserts and the CVS flyer laid out on the dining room table, I followed rule #3 above and looked for bargains. 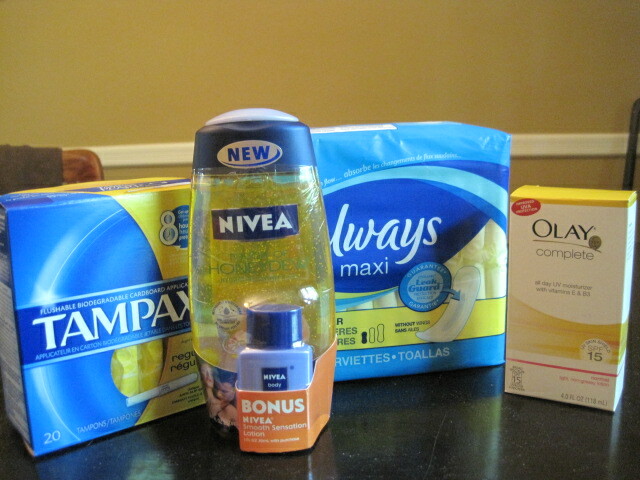 First up, I reviewed the CVS flyer for items I knew we could use (either now or in the near future). Then I leafed through the coupon inserts to see if there were any matching coupons for those items. When I found those coupons, I cut them out. At CVS stores there is a special red machine which scans items for a price check. If you scan your Extra Care card, it will automatically generate coupons for you. You can scan your card more than once; the machine will tell you when you’ve reached your coupon limit. I’d never noticed the machine when shopping at CVS before, but I learned about it while doing my “smart couponing” research. At our local CVS, the red scanning machine is located just to the side of the front registers. 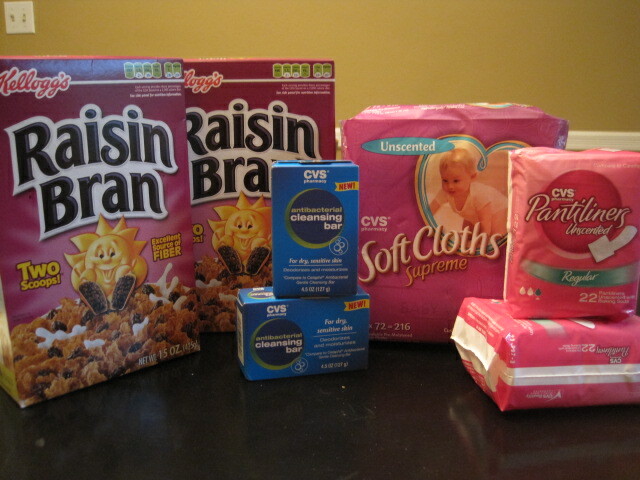 So here is the play-by-play of my recent shopping trip to CVS. Some of these coupons weren’t relevant to what I wanted to buy that day (and might never buy – I doubt I’ll use the CVS cosmetics coupon or the one for Hershey’s candy bars). 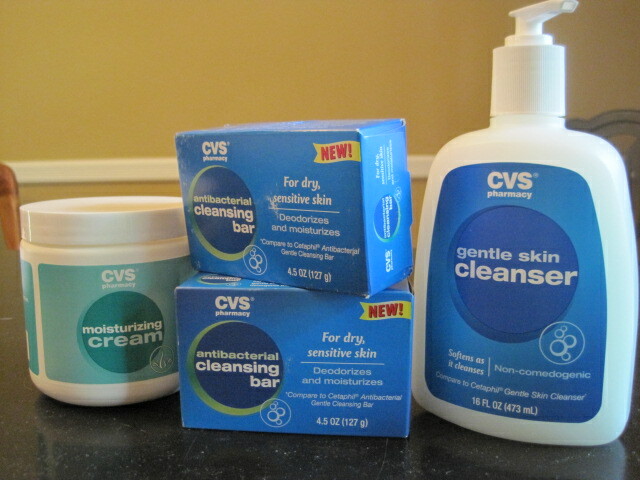 CVS was offering a special: buy $20 of CVS brand facial cleansing/moisturizing products, get $5 ECBs. Then I used three of the CVS coupons I mentioned above: $1.00 ECB, and the two coupons for $2.50 off CVS brand items worth $12 or more. I tried to use the coupon I had for $2 off 2 bars of soap, but the teller’s scanning machine rejected it (I guess I’d used my coupon limit; I can use that coupon another time). As an aside, the products above are the CVS version of Cetaphil products. I started using Cetaphil products over 15 years ago and I love them. They’re very gentle (the liquid soap is especially good as a body wash for babies and a facial cleanser for people with sensitive skin). As an extra aside, I’m actually not a big fan of antibacterial soaps which these bar soaps are, but CVS was out of the non-antibacterial-Cetaphil-knock-off bar soap. Anyhow, the CVS versions of the Cetaphil products are just as good and about 2/3 the price. But, I broke coupon rule #2 above – don’t be loyal to a particular brand. Had I been willing to purchase any soap and moisturizer, I would have saved a lot more money. The bottom of my receipt from this transaction had my $5 ECB coupon for spending over $20 in CVS products, so following rule #6 — make multiple purchase transactions at the same store –I tore off my $5 coupon and went shopping for a few more items at CVS. It was time to put rule #1 — coupon stack — to work. Then I gave the teller my $5 ECBs coupon that I had earned in my first transaction. Final total (without tax): $4.81. Had I bought all of these items at their original price, the total would have been $22.57. This represents a 79% savings. Now, truth be told, I don’t normally buy shower gel (we routinely use the bar soaps and liquid soap I bought in the first transaction instead). But, we’re out of liquid hand soap. Since I got the Nivea shower gel for just $0.88, this is substantially cheaper than buying the same amount of liquid hand soap. I’ll just refill our old hand soap dispensers with the Nivea shower gel instead. While I’m very happy with this result, I should tell you that this amount of savings is nothing compared to what experienced couponers can save. There are some people who are so sophisticated at this that they can walk out of stores paying next to nothing for a large amount of items. Oh well, there’s a learning curve to being coupon-smart, and I’m definitely still learning. I don’t clip coupons. There, I said it. (Although with our new budget, it’s probably time that I address my aversion to coupons.) In the meantime, I thought I’d pass along to all you Southern coupon-clipping-shoppers out there that Harris Teeter is offering triple manufacturers’ coupons until March 30. Today’s paper had a flier from Harris Teeter that proudly advertises their triple coupons deal. But, I noticed that their flier also says, “Up to $.99 face value. Limit 20 coupons per household, per day.” Okay, I get the limit 20 coupons thing (although I can’t imagine being such a coupon clipper that I have 20 of them to use each day for a week! ), but the “up to $.99 face value” had me a little stumped. So I called our local Harris Teeter and asked someone in customer service what it meant. She said that they will triple all coupons for $.99 and under. That is, if I have a coupon for $.50 off toilet paper, then they’ll give me $1.50 off. Yes, I understand that, but what if my coupon is for $1.00 off toilet paper? Ah, then you only get $1.00 off. If it were for $.99 off toilet paper, then you’d get a $2.97 discount. Tricky. So there you have it. Happy coupon clipping and saving!